Many Bahororo and Bahima of Kigyezi share clans and lineages with their Banyankore cousins. Whereas Banyakigyezi and Banyankore communities are no longer organized according to clan, knowledge of one’s clan, totem and taboos is important for (a) one’s identity and (b) avoidance of consanguineous marriage. The taboo against intra-clan marriage is informed by a need to prevent negative genetic consequences for your offspring. Consanguinity (where a couple are biologically related) increases the risk of offspring inheriting bad and sometimes disorder-inducing genes. When in doubt, ask before falling in love or engaging in sexual relations with someone from ethnic community. Intoore dancer in Washington, DC. The most well known dance from Gisoro (Kisoro, Bufumbira) is the Kinyarwanda dance of Intore (the chosen ones), who were the king’s military dancers. Over the last few decades, the word has evolved to refer to the dance itself. The Intoore dancers would perform at the court of Umwami (King), telling the story of their exploits in battle with gracefully choreographed dances accompanied by songs and drums. The male dancers are trained to jump as high as 2.4 meters off the ground. 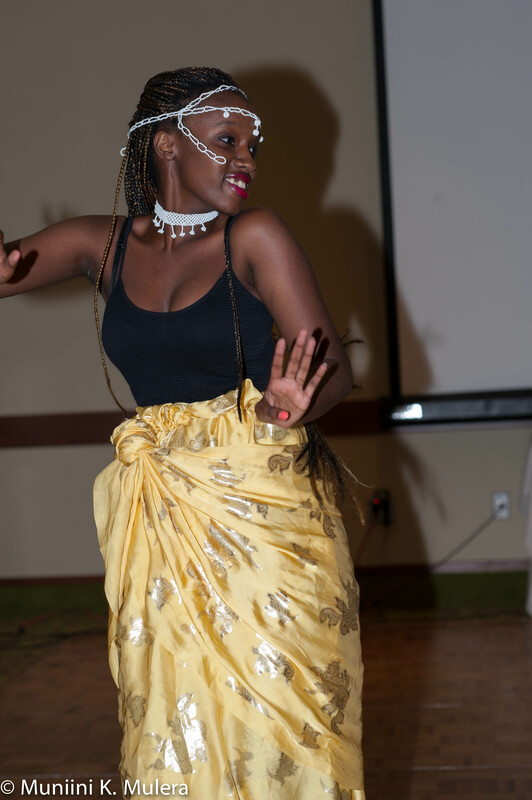 The Kikiga dance (of the Bakiga) is called ekizino or ekisoomo (okusooma). Accompanied by okutongyerera/okweshongora (rhythmic call-and-response singing,) okuteera omu ngaro (hand clapping,) and okuteera engoma (drumming) and/or enanga (zither or harp music,) the dancers jump up and down energetically with arms stretched in front, and mesmerizing footwork that reveal practiced agility. Other instruments, such as Omukuri (flute) and Endingiri (Violin) may also be played as accompaniment to Ekizino. Rwakarungu is a special version of ekizino, which features side-to-side gyration while lifting and dropping one foot to the rhythm of the accompanist. It involves stomping with one foot, with the other leg firmly planted on the floor. It is usually danced by men who have had their fill of an alcoholic beverage, the agility required in the normal ekizino having been severely compromised by the effects of alcohol. Above: Herbert Bakesigaki plays enanga in 1994. He was one of the best on this instrument. 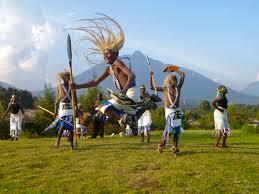 The Bahororo have Ekitaaguriro, a dance that shares a lot with the dance of the Bakiga, but with less energetic jumping. The Kizino and Kitaguriro are often preceded or followed by a poetic, rapid-fire recitation called Okwevuga (as Bakesigaki does in the video.) The Omwevugi (poet) recites his genealogy, his exploits in battle, his wealth of cattle and other things that entitle him to greatness. American rap music had great precedents in Africa.